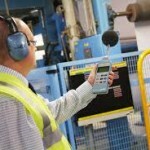 We get asked all the time about workplace noise and what can be done to reduce the risk of long term loss of hearing. Construction sites and manufacturing centres in particular can be very noisy places and it’s important that employers and staff take necessary precautions to ensure they do not risk damaging their hearing in the long term. First, are you aware which sources are most hazardous, and which steps you can take to improve your workplace hearing safety? Temporary deafness often occurs after exposure to noisy areas, with your ears taking a few days to return to normal. If your ears are exposed to this level of noise continuously, there is a real potential for them to sustain permanent damage. Similarly, permanent damage can occur from sudden, unexpected sources of work noise, such as falling debris or, less commonly, explosions. A safe level of noise is generally considered to be up to 85 decibels (dB), but construction site noise frequently exceeds this. Generally, worksite noise will be from heavy machinery like compressors, concrete mixers, presses, concrete breakers and compactors. As levels rise, the safe level of exposure time falls: 88dB, for example, is considered a safe level of noise for up to four hours; the recommended exposure time at 100dB is 15 minutes; and when noise reaches 111dB it will start to do damage after only 56 seconds. High noise levels on worksites can be lowered by using both engineering and administrative controls and personal protective equipment (PPE), such as earplugs. Generally, employers and staff should work together to ensure that process and control strategies are in place first, and provide PPE as a further preventative measure; however, both are vital at all times. 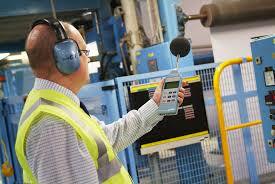 Where noise is a risk at work at employers must at least carry out risk assessments, education and training at 80 dB and above; hearing protection and prevention must then start at 85dB. Accurately assess the noise risks on-site by measuring sound levels: if you have to raise your voice from two metres then noise will typically be above 85dB. If you are unsure you should use noise rating equipment; make sure you keep accurate records of all measurements. Use manufacturer information to source equipment which has the lowest noise rating; for example, by purchasing saw blades with greater numbers of teeth and smaller gullets you can reduce noise by up to 6dB. If a job is particularly noisy, ensure that workers not involved in the task are moved away from the area. Prevent access to noisy areas using barriers and use signage to warn people about dangerous noise levels; only allow entry to those wearing adequate PPE. Modify noisy equipment with damping materials, mufflers, or silencers and shut down when not being used; this will reduce the average level of noise emitted. Restrict average exposure to noisy activities by introducing work rotation policies; this will ensure the same staff do not experience continuous exposure. For workers in close proximity to noise emitting equipment, earplugs should be worn at all times. and make sure staff keep them in a safe place ready for each shift; work should not be allowed to begin without them. 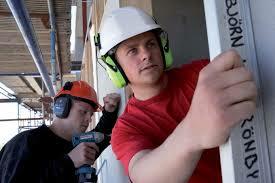 Ensure that wearing earplugs does not interfere with the safety of other machinery or equipment.